The focus is on linear speed and snap. Defenses are straight up, down, in, out, and side. Offense is straight, side, back, and forward. 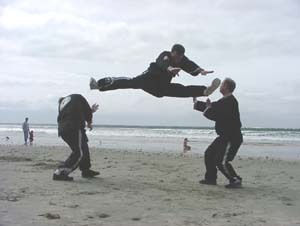 The feet (especially front snap, side and reverse kicks) are more often used than the hands. The form is hard. The strikes are usually straight, and in all different angles. Oom Yung Doe Martial Arts uses Kong Su as part of its basic training, because the movements are simple and linear providing a very basic, but necessary foundation of speed, strength, and coordination before learning more advanced and intricate martial arts techniques. Kong Su movements are very beneficial for younger students for building reflexes, coordination, and timing. It is recommended for students over 50 years old to practice these movement lightly without snap as it can be overly stressful on the joints.